Grab hire in Manchester services will become increasingly popular with a host of high-profile construction projects greenlit for the coming years. N.D Brown have provided grab hire in Manchester and all over the country for over 30 years from our perfectly positioned four depots. We offer a variety of tipper grabs from 7.5 tonnes to 32-tonne vehicles which can be hired or purchased from short- or long-term assignments. With regular experience working with a host of construction firms we can offer insight into the suitable size of vehicles to fit any length of the program. Steered by former footballer Gary Neville, this £200m development will see another skyscraper added to the Deansgate area, with luxury apartments, a new synagogue, offices and a roof garden with work expected to begin later this year. The famous Boddington’s Brewery site which closed in 2005, will make way for over 500 flats in a £175m redevelopment of the site which will also include 40,000 sq. ft of retail and commercial space. It’s been over 20 years since this landmark venue in the city centre was last overhauled, with the first stage of the redevelopment set to add apartments to the upstairs to replace the warehouse’s current parking space. This unfinished car parking plot on River Street is set to be demolished and be replaced by a 32-storey skyscraper containing 800 student homes. Our fleet of 450 vehicles stands ready to assist with any sort of construction project. 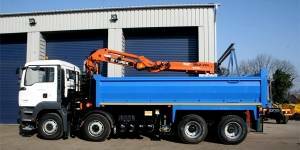 Plus we don’t just provide tipper grabs, we also have HGV’s, Cage tippers, hot box and 4×4’s available for hire or purchase – giving you the complete package! Get in touch with our team of experts today and we can share our industry knowledge and make sure you get the right vehicle or vehicles for you.